Recall the last time you experienced a simcha with the grandeur of a bygone era. Ambiance is a crucial factor in choosing a venue for your special day. The choice of where to host your simcha can transform an otherwise nice wedding into a unique and unforgettable affair, one that you and your family will cherish for years to come. 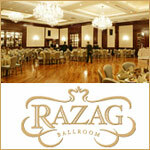 The Razag Ballroom, located in the heart of Crown Heights is the exquisite new venue that creates just such an occasion. Get more for your wedding! Don't forget to mention ChossonKallah.com when visiting RAZAG Ballroom. The ballroom is beautiful, the food is delicious, amd Moishe is great! I highly recommend it! I liked it so much that I made another weding there also. made a wedding there! it was amazing! beatiful place! and great food love it! a real shtaty place! The initial hall we booked gave away our date. It was quite emotional when that happened.My parents wantedd a grand wedding for us (I wanted something simpler.) Meanwhile my father in law searched (from LA) all the possible halls open for our intended wedding date. Hashem definetly had better plans for us! Baruch Hashem the initial hall fell thru and Razag was available.My parents both agreed it was a beautiful hall and appreciated Moishe's customer relations. Razag was incredible to work with. Moishe is so patient and really tries to cater to your style and event. Our wedding was phenomenal bli ayin hara! Our guests (including the critical ones) were quite impressed with the ambiance and loved the food. I highly recommend Razag!